RIR’s Inna Fedorova caught up with iconic fashion designers Domenico Dolce and Stefano Gabbana, when the duo visited Moscow. RIR: This is not your first visit to Moscow. What changes have you noticed? 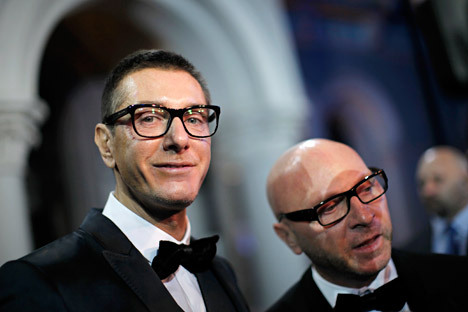 Stefano Gabbana: We came to Moscow to celebrate women and their beauty, which for us is encapsulated in the Dolce&Gabbana Beauty world. Russian women love to be beautiful and they care a lot about their personal appearance. Domenico Dolce: We have always loved Moscow’s peculiar energy. The city itself hasn’t changed much since our last visit in 2011. S.G.: But maybe the changes are more subtle, more in the mentality and attitude of the people. RIR: Of course Russians think that Russian women are among the most beautiful in the world. I think we all agree that despite all the changes, Russian women are still among the most beautiful. How do you understand the phenomenon of Russian beauty? D.D. : I think it has historical reasons. Under communism, the beauty was kept in the dark, as there were not enough quality clothes and make-up, so now this beauty that was hidden for a long time is being revealed. At the same time, in the West, women seem less interested in their beauty than they used to be. But in our homeland, the Mediterranean, a lot of women work, have children, clean the house – they organize everything. And these women don't lose their femininity. In Italy, women are like Anna Magnani, Sophia Loren – very strong. I love Russian women, because they are very feminine too. And in this respect Russia has much in common with Sicily and Italy. RIR: What would you say about the way Russian women dress? D.D. : They do it beautifully. It's in their DNA. I love when they cross their legs. Russians crossing legs look so elegant! RIR: And what about Russian men? S.G.: The process of changing is much more difficult for men. And for Russians especially, because they were isolated from fashion during the Soviet period. But now they are dressing in a more stylish way. RIR: Russian people are buying more and more stylish and expensive clothes now. What perspectives do you see for the Russian luxury market? D.D. : It has been a wonderful market for Dolce&Gabbana for a long time and we are lucky that women in Russia have such beautiful bodies, it's incredible. Russian women love beauty. Russian beauty is elegance, it is not an artificial, but a natural one. Moreover we are lucky that Russian men love beautiful women. Women are like icons for them, I think. I like their attitude. It has a Mediterranean style to it. RIR: How do you feel about style "a la Rus"? Have you ever had plans to create something in the Russian style? S.G.: We feel that Italians and Russians are very similar deep inside. So there’s no real need to create something Russian, it would look like a caricature, don’t you think? It’s best to remain true to one’s DNA, especially today when everything is changing so fast – you might end up having no identity. D.D. : Besides, if you look at Italian traditions and heritage, there are so many things in common with Russia. Think of our last collection, which featured mosaics on the dresses. They could have been taken from a Russian cathedral, but they came from Palermo and you couldn’t tell the difference. S.G.: Also, for the next Winter collection we were inspired by a fairy tale world, which is a universal world, Italian as much as Russian.